We live halfway in between SAT and AUS, but prefer SAT if it is possible. There are no direct flights from SAT/AUS to LIM. The most obvious choice that I have been looking at is taking SWA to an airport with a direct flight to LIM, such as ATL. We would use the companion pass to only pay for one SWA ticket to the positioning airport. We plan on not checking bags, so this would be fairly easy. Sam: Thanks for the question Oscar. I’m hopeful we can make something work for you. The first question I have is regarding your point balances. What do you have now, and what will you reasonably expect to have in the next 3-4 months? Oscar: We have a rather large pool of Southwest RR points, about 21k SPG, and my wife has 32k UR. I have 105k UR due in a few months and my wife has none right now, but should have 100k+ later this year. I don’t have enough Chase UR currently for this trip, but according to AwardHacker, I’m seeing 35k R/T on Flying Blue, 40k R/T on BA and on UA. However, when I look at those websites to look at possible booking, the flights are much more expensive. I have never booked an international award flight, so I’m just at a loss for how to proceed here. What are my best options? When should I start looking to book the trip? Sam: Thanks for the recap on the points. You should have plenty soon enough, which is good. The main issues I see are that you are way, way outside the booking window for this trip. You’re about 3-5 months outside of the initial booking window for a trip like this (330-ish days). That’s actually preferred over the opposite–having too few miles having missed the booking window, so don’t think of that as a negative. Second, hypothetical information is good, and AwardHacker presents a good amount of it in a tight package. But it also can result in a bit of information overload. I think that’s what is going on with you here Oscar. You’ve got the numbers right, but that’s only half of the battle for a booking like this. I won’t get into the why AwardHacker is probably confusing you in this situation–those reasons will become clearer as you research and book more tickets yourself in the future. I’m going to do this booking as a cash booking first, and then step into it again as an award booking. This has the benefit of giving us clarity as to what it would cost us if we book it directly via the UR travel portal, or if we transfer points to an airline and book with miles. It also gives us information on who flies the routes and what good and bad flight options look like. Applying a filter at 15 hours eliminates all of the subpar results. I could also further restrict this to 1 stop flights only. If I restrict this down to 1 stop only the prices rise by about $200 (13.3k UR @1.5cpp). You can pretty easily see the pricing trends here, and some quick math would show that for dates on the low end, $644 you could book those at 1.5cents per UR using 43,000 points. On the high end, the $944 dates would need 63,000 UR if booked via the UR travel portal. Oscar’s gotten quotes from 35,000 to 40,000 via AwardHacker, but he keeps mentioning that he only sees higher priced flights when he’s done his searches. The reason for that discrepancy is likely that there are no low-level awards on the dates he is looking at. Low level awards would be analogous to the green dates above. They don’t always match up with the lowest price paid dates, but thinking about low level award seats as restricted fares that are only offered some days, or in limited numbers of seats on each flight is a good way to start thinking about award travel. Similar to the Brandon Asks post where we helped Karen find a hotel near Fenway, the answer as to the best program for Oscar is clear and yet it is hard to explain. For Oscar and his wife’s trip to Peru I’m going to suggest we look at using United Miles first, and only if those aren’t working out for us we should then look at another option. I’ll step through the why a little later, but first I want to talk about positioning for a moment. Oscar mentioned positioning, saying he would use southwest points to fly to/from ATL and then onward ATL-LIM on an award ticket. From the above Google Flights search you can see that there are pretty good paid tickets leaving from SAT. I can understand how one might think positioning is necessary, there is often a lot of discussion surrounding it online. Yes, it does add flexibility like Oscar mentioned. But we’ve got 90 days worth of flexibility (Jun/Jul/Aug) and lots of potential routes and carriers. Combine that with the transfer partners UR allows for and I don’t think positioning is going to necessary. Note: Positioning is something that I’m not a huge fan of. There can be mis-connect issues (breakage! ), and you have to recheck luggage most of the time. You may even need a hotel room for a night. 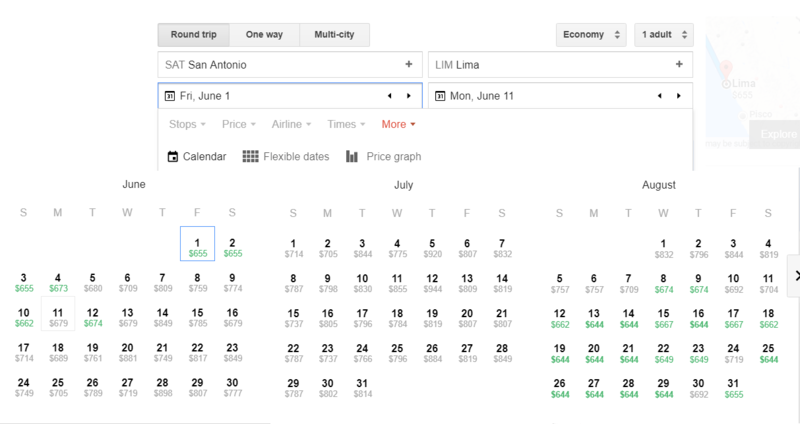 If we’re going to get serious about positioning to an airport with nonstop service to LIM I’d actually say that Oscar and his wife should just bite the bullet and drive to Houston, but I won’t recommend that…yet. I’m using the flexible search here and going with 10 days. Promising! We’re seeing lots of options and this is for this year, 3-6 months from today. What this calendar view doesn’t show us is if these flights are any good. They could be 2 stops, long connections, etc. I’d rather sit in coach with 1 stop than 2 stops in the forward cabin. My time is valuable. Extremely valuable. These are short flights and the time zones are vertical, so jetlag will be minimal. I’ve personally flown to Lima in both coach (nonstop) and Business (1 stop). I would chose nonstop in coach 10 times out of 10, and would therefore recommend the same to you Oscar, as few stops as possible regardless of cabin. Automating this search is possible, using more advanced techniques which I’ve covered before on the blog. But for now I don’t want to add too much information. I think doing things manually as much as possible is best. Similar options exist in June, July and August 2018. It is probably safe to say that next year would mirror this year. Personally, I’d choose the coach flight every time. The ‘Mixed Cabin’ is the SAT-IAH flight, only in coach. I really like these return flight times, you can wake up, have breakfast at your hotel and be home in your own bed that same night. Could Should You Book This? That’s the real question with any award booking. It isn’t ‘could you book this’ because you can see above that it is easily possible to do. Just transfer 80,000 UR to your United account and then step through the booking online using the search options and strategies above. The total cost for these tickets would be about 40,000 miles and $77. That’s below the ceiling of UR if you booked via the Travel portal. I’m not going to stop here however, there are still plenty of tricks up my sleeve with respect to booking this with United miles. Remember early on I told you that I was selecting United and would explain why later? Well, now that we’re a little more into the booking and have covered some basics I want to talk about hypothetical situations that you might encounter when you go to book next year’s flights. Ideally with enough time to plan ahead you should be able to book yourself onto the SAT-IAH-LIM 1 stop option. That’s a superior flight, only 9.5 hours total travel time, and it is available on some days, if you book early enough. Even if it isn’t available on your days there’s a nice BYOE trick you can use: You could give yourself access to additional award space by applying for a United Mileage Plus Explorer card. Doing so would give you access to the IAH-LIM nonstop flight on dates that United allows for extra availability (called XN space). There are 9+ award seats on some days if you have a United CC. 0 if you don’t. Before you run out and apply for the card, remember these are just hypothetical situations. You could do your actual search in September/October and find that for next summer there is plenty of ‘average joe’ award space on the IAH-LIM nonstop flights you want to fly. And if there isn’t space come September/October I think it is pretty safe to say that you can then apply for the card and still put together this trip without an issue, as I’m still seeing XN space for this summer. And If That’s not Enough, How About a FREE Flight? The reasoning behind using United for this booking continues to firm up, and now I can get into the real ‘killer app’ of United and South America: Free flights. Ok, nothing is really ‘free’, but United has a nice benefit that allows you to add on a flight for $0 miles and the taxes. Oscar, Do you have any other parts of Peru besides Lima you’re interested in visiting? Oscar:We definitely want to see as much of the country as is feasible. We are leaning toward doing Macchu Picchu but are open to other areas and have not decided that yet. Remember these prices in miles and money are fixed so long as you can find low-level space on UA.com. You can see at least 2 different cities, so you’ll ideally want to conceptualize where exactly you want to go now, before you sit down to search for flights. The above shows you just how far you can take things in this situation, but it isn’t necessarily what’s best for you. I like to say that award bookings are like putting together a puzzle when you don’t have the box. This could be booked with oneworld airlines using avios, and could solved with FlyingBlue miles as well. But none of them match the value of the above United solution. The last thing I wanted to mention is that you shouldn’t feel nervous about booking this first award. You have 24 hours to cancel your award with no penalty, so you can do a dry run attempt at booking something and if you made a mistake or missed something you can cancel right then and there without any fees. Hopefully some, or all of the above will come in handy when Oscar gets ready to book his actual flights. What do you think? Any angles we missed? Any tools you use that would have been helpful in situations like these? Join the conversation by leaving a comment below. And drop us an email or hit us up on Twitter @Milenomics if you’d got a puzzler we can tackle. I like the puzzle of maximizing award travel, especially the “free flight” that Sam talks about. I have made a LOT of use of that feature over the years and it has led to some awesome experiences. But I think something is missing here (or was left out for brevity’s sake): what is Oscar trying to accomplish on this trip? I mean to say that Sam and Robert are covering the “how” pretty much, but do know the “why”? Does Oscar want to see Lima (big city, great food scene, not too safe) or Inca civilizations (in which case, the goal needs to be to get to CUS)? Are the Nazca lines a priority or the Peruvian Amazon basin? Is Oscar interested in places that are not necessarily in Peru but are quite easy to include in a Peru trip, like the Galapagos Islands? Is he willing to pay for some flights, to get a mix of places, or is the goal to go one or two places as cheaply as possible? I’ve found that planning this kind of trip is an iterative process–and this is both fun and stressful. I have some ideas and then mentally “rank” them, and try to make them happen—sometimes new ideas pop up in the process. Just one example for Oscar to consider is the fact that Copa airlines (United partner still, I believe) has it’s main hub in Panama and , from there, flies direct to Texas and many points in South America. So why not add Panama City as a stopover? It’s “on the way” and has a lot to offer! Excellent points blue, I think Oscar has a lot of research ahead of himself here about the actual places to go, and he’s got plenty of time to do that research as well. I really struggled with this post, not so much because I didn’t have ways to solve the problem, but because there really wasn’t a full problem to solve. This is the 3rd attempt at writing a helpful, yet concise post, and I think in actuality your comment is just as much help for Oscar as the 3,000 words above it are for the technical side of the booking. I’ve sent a message along to him via email to make sure he reads your comment, and any others that come along. I think that 10 days is going to be the biggest limiting factor for a trip like this. The idea of a trip from A-B-A is so core to the idea of paid travel that it is a hard one to shake until you really start getting into the mechanics of it all. Here we’re opening the door to multiple cities and even countries. That could be additive, and open up new places to see, but could also dilute things if not enough time is spent in any one area to really enjoy it.